Restore your classic Nova/Chevy II model automobiles with a complete line of Nova car parts, featuring Chevy Nova restoration parts for 1962 -1979 cars. Enter the Promo Code - C73NV - at checkout on the Nova/Chevy II Parts from Classic Industries website. Chevy Nova car parts - Classic Industries is every Chevy Nova owner's most trusted source for Nova car parts from the years 1962 to 1979. Find a complete range of Chevy Nova restoration parts including brake parts, fuel system and engine parts, Nova body parts, exhaust, steering, Nova suspension parts, transmission, cooling systems, weather-strip parts, Nova wheels, tires and even more prime parts for your classic Nova vehicles. Nova exterior & interior parts - Invest in all of the fundamental Nova car parts that will have your automobile running like a dream, as well as sleek cosmetic Nova restoration parts that will keep her interiors and exteriors looking just like new. From new carpeting to new Nova seats, interior upholstery to Nova exterior styling parts and accessories, your Chevy Nova will look better than she has in years, from the inside out. Nova body parts - From fenders and bumpers to doors and dash, Classic Industries features a wide range of Nova car parts that will perfect every inch of your vehicle's body. Search for quality Nova body parts from small body components to full body repair panels and accessories that will have your classic Nova's body fully restored in no time at all. 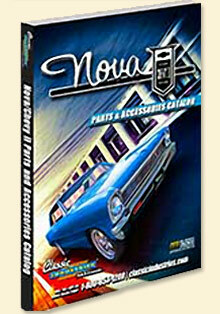 Nova wheels & tires - Classic Industries keeps your Chevy Nova car in gear from top to bottom right down to her wheels. Find an impressive selection of Nova wheels and tire sets, lug nuts and studs, wheel studs, wheel covers, valve stems and caps, wheel paint and other restoration based Nova car parts and accessories that will keep your wheels in pristine condition. Nova/Chevy II Parts from Classic Industries supplies you with the classic Nova parts your car is craving. From Nova restoration parts for the interior, exterior, front, rear, AC, wheels or undercarriage, Classic Industries will bring your Nova back to life with quality Chevy Nova parts that will cover any repair.